About one month after Donald Trump won the 2016 presidential election, Ohio Treasurer Josh Mandel (R) announced 1 a long-expected 2018 U.S. Senate bid against Sen. Sherrod Brown (D-OH), who defeated Mandel 51%-45% in Ohio's 2012 Senate contest. Should both politicians win their party nominations -- at present, each appears favored to do so -- the Buckeye State will likely see a rollicking rematch with millions upon millions of dollars spent on behalf of or against the populist-liberal Brown and Trumpish-conservative Mandel. In the GOP primary, Mandel will first have to get past businessman Mike Gibbons, who has hired staffers with connections to Gov. John Kasich (R-OH). Mandel and Kasich have a strained relationship for a few reasons, including Mandel's refusal to back Kasich during the 2016 Republican presidential primary. Additionally, Melissa Ackison (R) just entered the GOP primary as well; Ackison, who owns a surveying and engineering firm with her husband, is another newcomer, and the White House recently highlighted her family's health care struggles 2. Ohio doesn't have a runoff, so it may be better for Mandel if he faces multiple opponents who could split whatever anti-Mandel vote there may be. So Mandel begins as a clear favorite for the GOP nomination, and if he wins it, he and Brown -- the incumbent is unlikely to face a viable primary challenger -- will be headed for a rematch, thus far the only one that appears to be on tap in 2018. Senate rematches are relatively rare occurrences, at least in the context of there being more than 30 Senate elections every two years. 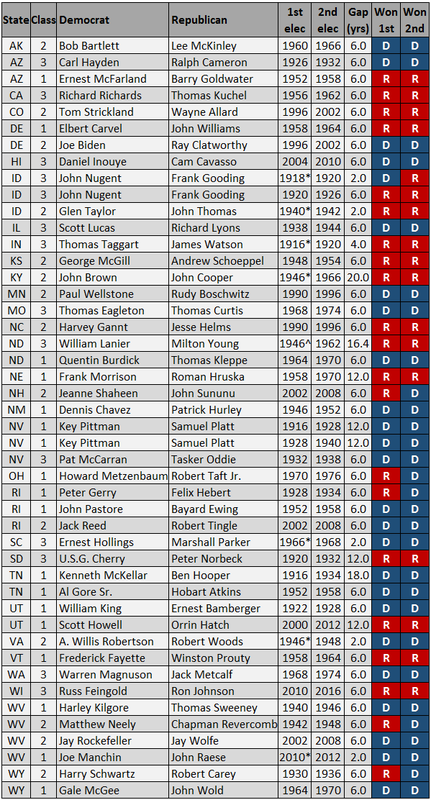 There have been 46 separate Democrat-versus-Republican rematches in the era of popular elections for the U.S. Senate (since 1913), with 44 different pairs of candidates (two pairs had three contests against one another, i.e. two rematches). There has been at least one rematch contest in 28 of 52 regular federal elections going back to 1914, the first cycle with popular Senate elections. Table 1 lays out all 46 separate rematch contests by state. Notes: A “*” denotes a special election on the regular November election day. A “^” denotes a non-November special election. Overall, West Virginia has had more Senate rematches than any other state, with four. The Mountain State moved into the lead in this category following the 2012 victory of Sen. Joe Manchin (D) over John Raese (R). Previously, Raese lost to Manchin in the 2010 special election for the same seat, which had been held by long-serving Sen. Robert Byrd (D). Interestingly, Raese has run unsuccessfully for the Senate on four occasions, losing to former Sen. Jay Rockefeller (D) in Rockefeller's first Senate bid in 1984 and then to Byrd in 2006 before back-to-back losses against Manchin. Next up are Idaho, Nevada, and Rhode Island, which have had three rematch elections each. But the first two also feature the two instances where the same pair of candidates faced off in two separate rematch elections (or three times in all). In total, 31 states have had at least one Senate general election rematch, as shown in Map 1. The two regions of the country that have seen the fewest rematches -- in terms of the percentage of states with at least one -- are the Northeast and the South. There are a few possible explanations for these regional patterns. The paucity of general election rematches in the Deep South speaks to the region's one-party Democratic history as the Solid South and the more recent turn toward one-party Republicanism in some of these states. That is, the minor party in the South didn't necessarily keep turning to the same candidate to run in part because there simply were not many (or any) potential candidates for the minor party to run. If we were to measure rematches in party primaries, the South would have many past examples because primaries have often been the main decision point there. In the South, the Democratic primary was once “tantamount to election” in November, and the same is true for the GOP primary in some southern states today. The Northeast is a little harder to figure, but it's possible that state parties there have had more control over the nomination process in some of these states, leading them to pick different figures to run after a failed electoral bid in the previous contest. For example, New York only readopted a primary system in 1967 (it had previously abolished them for statewide offices in 1921), and Connecticut usually has primaries only if multiple candidates get a baseline level of support at a state party convention. Of course, some of this is just down to random chance. A strong party figure might pop up again to run because there might not be another option, and this collection of races forms a very small sample of the nearly 1,900 Senate contests that have taken place since the ratification of the 17th Amendment in 1913 established popular elections for the Senate. 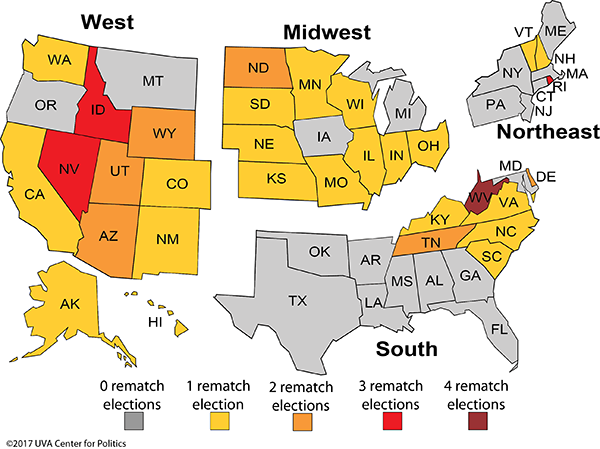 Small states have also been much more likely to have rematch contests than larger states. About 70% of rematch Senate elections have occurred in states that ranked 26th or lower in population in the census (or average of the two censuses) closest to the pair of elections in questions. A repeat Senate candidate may have a better chance of winning his or her party's nomination again in a state with fewer people than in larger states where there are simply more potential office-seekers. Generally speaking, these 46 rematches can be categorized into four bins. The first category would include the possible rematch between Brown and Mandel, where a sitting incumbent defeated a challenger, and then the challenger tried again for that seat in the next election against the same incumbent. There have been 16 such rematches. The second category includes cases where a sitting incumbent faced a challenger and lost, but the ex-incumbent then sought to regain his old seat in the next election by defeating the former challenger, who was now the incumbent. There have been eight such rematches. The third category covers rematches where the initial election was for an open seat, and the loser of that election challenged the victor of the first contest in the next election for that seat. There have been 14 such rematches. Lastly, the fourth category covers rematches that saw long periods of time between the first election featuring the two candidates and the next one. There have been eight such rematches, ranging from 12 to 20 years between contests. Of the 16 cases where a challenger faced off in a general election against the same incumbent he or she lost to in the last election, only once has the challenger won on the second try. This perhaps speaks to the strength of incumbents in general, and might be reassuring to Brown. Nonetheless, this is a very small sample size. The one exception occurred in Idaho in 1920, when Sen. John Nugent (D) lost in a rematch against challenger Frank Gooding (R), a former Idaho governor. Nugent had been appointed to fill the Gem State's Class 3 Senate seat in January 1918 following the death of Sen. James Brady (R), and then Nugent narrowly defeated Gooding by one percentage point in the November 1918 special election to serve out the remaining two years of the term. But Gooding got his revenge in the Republican landslide of 1920, winning by eight points to help the GOP gain 10 net seats in U.S. Senate elections that cycle. Though it technically falls in the second category, it should be noted that Nugent attempted to regain his seat against Gooding in 1926, the next election for that seat, but actually finished third behind Gooding and a Progressive Party candidate in a three-way race. The average challenger in Category 1 races actually performed, on average, about two points worse in election margin in the second contest compared to the first. But this finding comes with the important caveat that challengers have had closer margins the second time around in eight of these 16 contests, and the median change in margin for challengers is actually about zero. So they likely offer little future value for predicting the fortunes of someone like Mandel. Eight rematches, including the aforementioned second one between Gooding and Nugent in Idaho, fit into the second category. In these cases, an incumbent lost to a challenger in the first matchup and then tried to regain the seat in the next election. It's a small number of examples, but former incumbents who attempted to avenge a previous loss have performed very poorly. Exactly one of the eight ex-incumbents succeeded in regaining his old seat against the man who beat him: Sen. Peter Gerry (D-RI), who lost his bid for a third term in 1928 to Felix Hebert (R-RI) but then beat the incumbent Hebert in their 1934 rematch. Since Gerry's successful comeback attempt, four other ex-senators have tried but failed to repeat his feat. The most recent case was in 2016, when ex-Sen. Russ Feingold (D-WI) attempted to defeat Sen. Ron Johnson (R-WI), who beat Feingold in the 2010 GOP wave, but failed. The third category encompasses rematches where the initial election was an open-seat contest and then the loser of that election attempted to beat the victor of the first in the next election. In 10 of the 14 cases, the winner of the first election also won the second, and in four instances the loser of the first contest won the rematch. Among the quartet of split results is the only previous instance of a Senate general election rematch in Ohio. In 1970, Rep. Robert Taft Jr. (R, OH-1), scion of the powerful Taft family, defeated Howard Metzenbaum (D-OH) by two percentage points in a closely-fought contest. But six years later, Metzenbaum beat Taft in another tight race by about three points. He would go on to hold the seat for three terms. Of the four instances where the loser of the first election won the second, presidential coattails likely played a role in three of them. Although Metzenbaum ran slightly ahead of Jimmy Carter in the 1976 cycle, the cases in 1936, 1948, and 2008 all saw Democrats benefit from strong performances by their party's presidential candidate. In 1936, Franklin Roosevelt won Wyoming with 61% of the vote, helping Harry Schwartz (D-WY) win 54% to defeat Sen. Robert Carey (R-WY), who had beaten Schwartz by 18 points in 1930. In 1948, Harry Truman won 57% in West Virginia, the same percentage that Matthew Neely (D-WV) won while defeating Sen. Chapman Revercomb (R-WV), who had beaten Neely in 1942. Neely, it should be pointed out, had served as a senator two separate times prior to running for Senate again in 1942. He had run for and won the Mountain State's governorship in 1940, but quickly realized that he preferred to be back in the Senate, prompting his failed 1942 bid. That is, he was reelected to the Senate in 1936, won the governorship in 1940, decided to run for his old Senate seat again in 1942 and lost, and then ran for and won that seat in 1948. Lastly, in the most recent example of a first-time loser coming back to win a Senate rematch, Barack Obama's 54% share in New Hampshire probably helped boost Jeanne Shaheen (D-NH) to 52% of the vote in her 2008 win over Sen. John Sununu (R-NH). Shaheen had lost to Sununu in 2002. The last category is mostly filled with curiosities. These were rematches with large gaps in between the first and second contests. Eight rematches featured candidates who did not face off in the next immediate general election for the same Senate seat but at least 12 years later or more. In every case, the candidate who won the first election was both a long-time incumbent by the time the rematch occurred and won said rematch. The rematches were typically not very close, with only one of the eight having a margin of fewer than nine points -- when Sen. Roman Hruska (R-NE) defeated ex-Gov. Frank Morrison (D-NE) in 1970 by five points after beating Morrison by 11 points in 1958. The largest gap of the eight races in this category, 20 years, came in Kentucky, with John Sherman Cooper (R) and ex-Rep. John Young Brown (D, KY-AL) running against each other in both 1946 and 1966. Cooper, who won the 1946 special election against Brown for Kentucky's Class 2 Senate seat, had some trouble holding on to the seat -- to say the least. He lost in the regularly-scheduled 1948 election to Rep. Virgil Chapman (D, KY-6). But Chapman died in 1951, necessitating another special election in 1952, which Cooper won against the appointed Democratic incumbent who replaced Chapman. In the next regular election for the seat in 1954, former Vice President Alben Barkley (D) ran against Cooper and won. But then Barkley, who was in his late 70s, died in early 1956, necessitating yet another special election for the seat that year, which Cooper again won. Cooper finally won reelection in 1960, and then faced Brown in 1966, 20 years after their first meeting. Cooper won the rematch by nearly 30 points, a far better margin than his initial seven-point win in 1946. While there are too few historical rematches to make any strong declarations about Mandel's chances against Brown in Ohio's 2018 Senate race, we can say a couple of things. Out of the 46 rematch elections, in only six did the loser of the first election go on to win the second. This speaks to the strength of incumbency, a well-known factor in electoral politics. Most of the exceptions involve friendly political environments, such as the open-seat avengers in the third category who won after initially losing. But Mandel could benefit from the hard-right shift that Ohio had in 2016, which could complicate Brown's reelection effort. Based on the small number of cases we have, we can say that if Mandel does win in 2018, Brown would probably be an underdog in a hypothetical 2024 rematch! Or, if Brown won again, the youthful, ambitious 4 Mandel might have a hard time making his third try a charm. 1. 5 In 1955, Connecticut passed a law establishing its “challenge primary” system. Originally, a candidate had to win at least 20% of the delegate vote at a party convention to qualify to run in a primary against the party-endorsed candidate. That threshold was lowered to 6 15% in 1993, and a candidate can also get on the primary ballot by collecting signatures from 2% of registered party members. New York also employs a challenge primary system of sorts, but it is based on candidates winning at least 7 25% of the state party committee vote. As in Connecticut, candidates can also collect signatures to gain ballot access in New York.